It’s no secret that I am a fan of Mozilla Labs projects besides being a huge fan of Firefox. We have seen some successful and exciting projects from Mozilla Labs like Mozilla Prism – the technology that lets you run web applications like desktop applications away from your browser, Mozilla Geode – that can bring location awareness to web applications based on your location and Ubiquity – which is like Launchy or Enso Launcher within your Firefox browser. Snowl is another one of Mozilla Labs products that is in the making and is getting some excellent attention from the team. We communicate and converse with each other online every day and there’s no shortage of apps and utilities that enable us to do so. But, if you looked at the number of protocols and providers in this area, it is mind-boggling! You might have heard bizzare words like Jabber, XMPP, etc in instant messaging. Now, there’s the micro blogging conversations like Twitter, Jaiku, Pownce, etc. For eg, I’m more and more getting to have conversations about some of the things I post on Twitter beyond interacting via comments. Snowl is an experiment to see if the web browser, which you on all the time when you are online, could help you follow and participate in such discussions. It doesn’t matter where messages originate. They’re alike, whether they come from traditional email servers, RSS/Atom feeds, web discussion forums, social networks, or other sources. Some messages are more important than others, and the best interface for actively reading important messages is different from the best one for casually browsing unimportant ones. A search-based interface for message retrieval is more powerful and easier to use than one that makes you organize your messages first to find them later. Browser functionality for navigating web content, like tabs, bookmarks, and history, also works well for navigating messages. Snowl supports two sources of messages to start with – web feeds & Twitter. It contains 2 interfaces for reading the messages. One is the traditional 3-pane list view & the other is the river of news view. Snowl version 0.2rc1 supports sending messages via Twitter, multiple Twitter account support, toolbar buttons for quick accessand a new stream view to keep track of messages in a sidebar while you are browsing in Firefox. 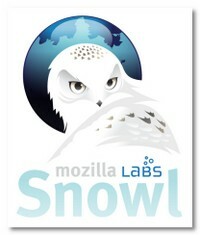 As the Mozilla Labs warns, Snowl is in the very early stages of development and is more for the early-adopters. You can try it if you wanted an exclusive sneak peek at what the future has to offer via your browser. It could become the next big thing or it could fizzle out. 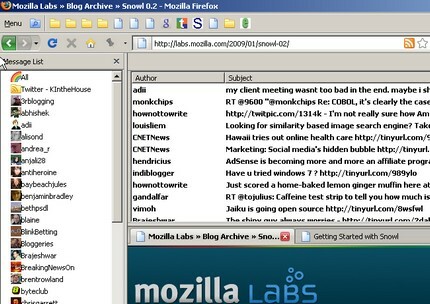 I didn’t have much luck running Snowl in Linux/Firefox 3 but it worked like a charm in my Windows laptop. I was able to get Twitter (you can find me as KIntheHouse) configured in no time and I was able to see the messages in real time in 3-pane mode or as a river of news stream. I was even able to send a message to Twitter from Snowl. Snowl brings the same technology you are used to in bookmarks management to your messages. You can sort/filter by date and do an ultra fast search in your messages, etc. Mozilla Prism hasn’t graduated from Labs yet but I still use it everyday to run my favorite web apps on Prism. And it is very stable. Ubiquity is also seeing some rapid development and now is a great time to try Ubiquity if you haven’t before. I love that too. I will be keeping my eyes on Snowl as it gets more features and stable. As far as I can see the future in technology looks as exciting as ever! Twitter fans will love it. Could be pretty useful for a variety of things. I’m sure they’ll work on stability issues. Awesome stuff, i guess i’ve been behind on my mozilla news, that is some cool stuff they are developing. I think it could be really sweet. thanks for the heads up. I could see this technology becoming very popular if it were to include instant messenger, email and other various ways to keep up with all your important conversations and contacts. This seems somewhat like tweetdeck but seems to offer more functionality.